Now that I've had my place photographed a few times over, I'm getting a much better sense of what does and doesn't work in my home. The dining room, in particular, has come out quite differently each time, but I'm really pleased with the way I styled it for the Glitter Guide shoot. There's a good mix of soft color and texture, and it appears both elegant and inviting at the same time. I thought I'd share a few tips that I've found to be most helpful in creating a beautiful dining space for entertaining. 1. Candlelight - the soft glow from candles add what I consider to be the most important ingredient to any successful dining room event: ambiance. 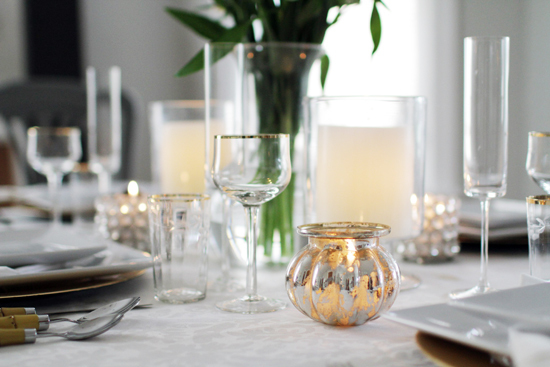 Even in daytime, candlelight will bounce off the walls and add sparkle to the most simple of place settings. I know candles can run at ridiculous costs, but look no further than Ikea. You can purchase simple, beautiful white candlesticks for $1 a piece! 2. Fresh flowers - essential for styling any room in the home. Flowers add life, color, and a sense of occasion. This bouquet was $3.99 from Trader Joe's. And if you have your own garden, pluck a few stems from there! Just make sure to shake them out. You don't want to surprise your guests with a lil' bug on their dinner plate. Vases can also be found for very affordable prices at major retailers and thrift stores. Or you can simply reuse an empty mason jar, for which I award you double points on the charm scale. 3. Stemware - white wine glasses, red wine glasses, champagne glasses, water goblets... the list goes on when it comes to the amount of stemware one can own and use in a place setting. It can definitely be a costly investment, especially considering how fragile it is. I'd definitely recommend investing in at least six of the same glass. 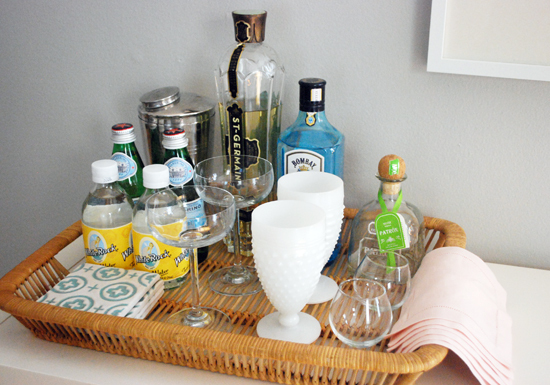 Again, major retailers like Target and Crate and Barrel and Ikea offer styles for as little as $1.99 a glass. Then there are the thrift stores like Salvation Army where you can buy vintage glassware for pennies! 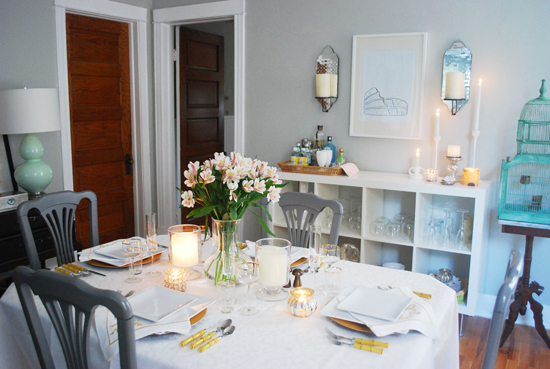 And if you're entertaining and looking to mix it up, borrow your favorite styles from family or friends. My mom loaned me the gold-rimmed glasses on this table. They belonged to my great aunt and uncle; he brought them over from Europe after World War II. Beautiful houseware and family heirlooms were made to be enjoyed. Not stored away on a shelf collecting dust. 4. Linens - linens are tricky. They stain. They need to be ironed. But man oh man, are they pretty. As with most things, I'd definitely recommend saving instead of splurging when it comes to the tablecloth. Red wine stains are just not worth it. 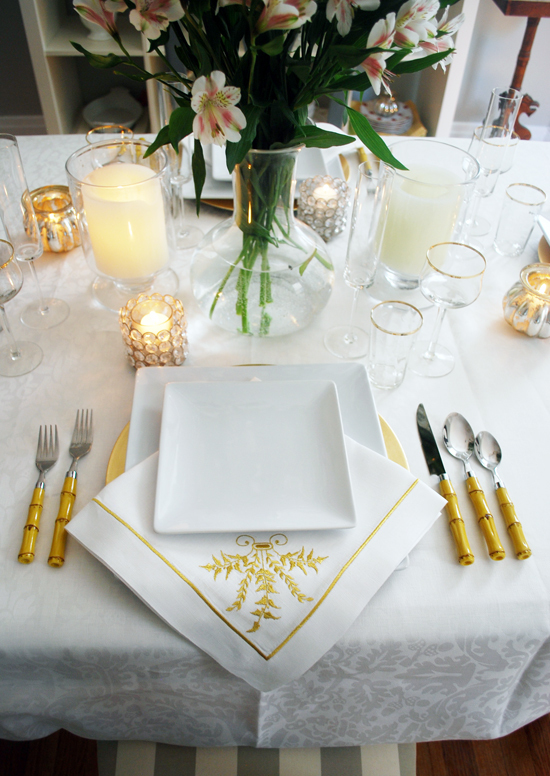 When purchasing linens, keep in mind the colors of your dinnerware and stemware. Neutral greys and whites are always a safe backdrop for the table, but if your plates are white, you'll want to add some color in the mix somewhere. Adding a colorful or patterned napkin is an excellent solution. The gold embroidered linen napkins in this photo were also on loan from my mom. She purchased them when we were in London from the William Yeoward store in South Kensington. She's fancy like that. I, on the other hand, own hot pink napkins that I believe were $3 a piece at Home Goods, and they work quite nicely. 5. The Bar - As you just read, I'm all for savings and finding affordable alternatives to higher priced items. But when it comes to alcohol, invest in the good stuff. I say invest for several reasons. 1. Your guests are ingesting this. It should taste good. Better than good. It should taste delicious! 2. The quality of alcohol you serve and drink will affect how everyone feels the next day. Don't send your guests home with headaches from over-sweetened mixers and cheap vodka. 3. Odds are, the nicer the alcohol, the prettier the packaging. 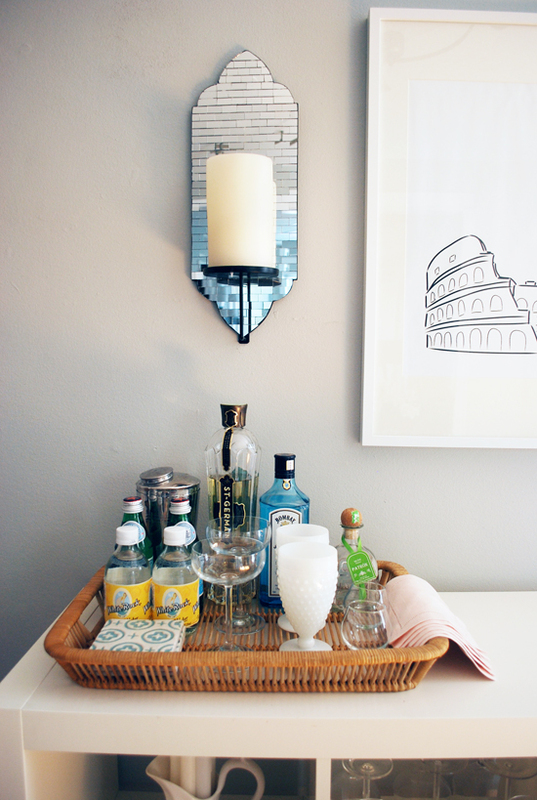 Look how chic the St. Germain, Bombay Sapphire and Patron bottles are! They add lovely shape and color to the overall decor of the room. So that's that! Drinks at my place, next week? I love this room! That white shelf is great! sign me up! i'll bring the hors d'oeuvres! p.s. i just pinned basically all of these photos for future home reference. love every detail! Great advice Alaina! Especially the bit about quality alcohol because there is nothing worse than a plastic vodka bottle hangover... except maybe an Andre hangover. Love your dining area. Your table setting is very gorgeous as well. 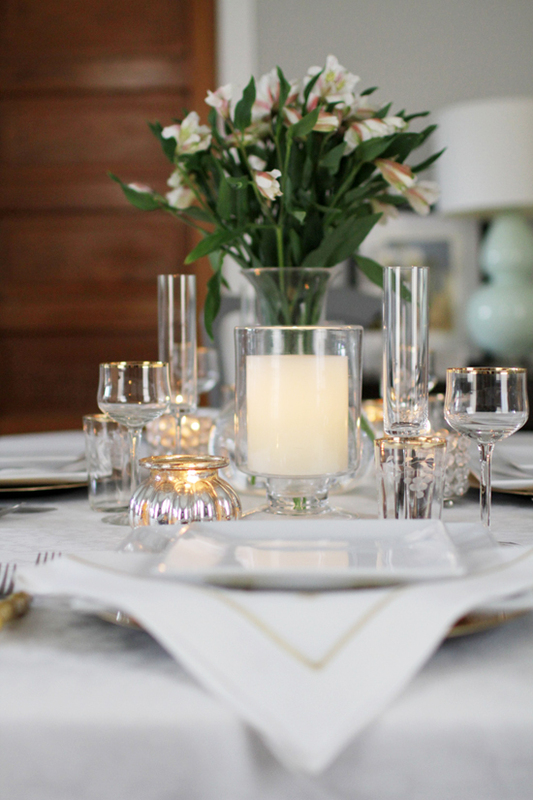 Adore your (mom's) fancy napkins, stemware and votive holders. Everything feels so casual yet elegant. P/S: By the way, I am hosting a giveaway. Come by and join for a chance to win a $75 gift card from Arcadian Lighting! I am so happy to have found your blog via the Glitter Guide! This is just the first post I read and I'm already in love! Love everything. Nice you and your mom have the same great taste! You did a great job! I love how much attention to detail there is...and the votives, although a small addition, make all the difference to the table. I agree about not spending very much on a tablecloth. I have a couple that were once white that I have have now dyed with tea to cover up stains. Now, I have a dropcloth that I had hemmed to the right size, bleached and don't worry if it gets a stain. Your house is lovely! Someday when my hubby and I get our own place [and stop renting], I hope it will be as lovely and welcoming as yours. Cheers!